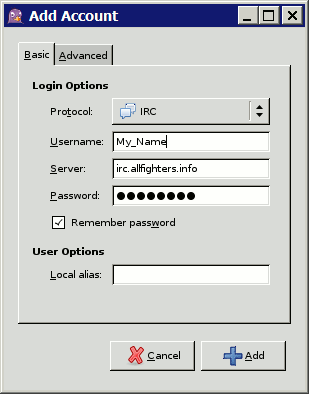 MeetFighters Chat is based on the IRC (Internet Relay Chat) protocol. If you know about IRC already, you can skip the basics and start using the chat right away. IRC commands all start with a "/" (slash). To enter a command, just type it into the bottom of the chat screen. On IRC, there are channels (the equivalent of "group chat", one that many members can join) and private chats. Channel names start with a # (hash mark). On our chat server, the main chat room is #meetfighters. There are two additional channels: #wrestling and #cyber. To join a channel, enter /join #channelname. To create a new channel, enter /join #newChannel. You can also chat privately with another member. To start a private chat, go to a channel (e.g. #meetfighters), double-click on the member's name in the member list, or enter /query membername. Better usability than anything browser-based. You can log your conversations. You can customize font size, colors, use plug-ins, etc. There are several IRC programs for all major operating systems. If you want to read more, we suggest starting with this WikiPedia article. 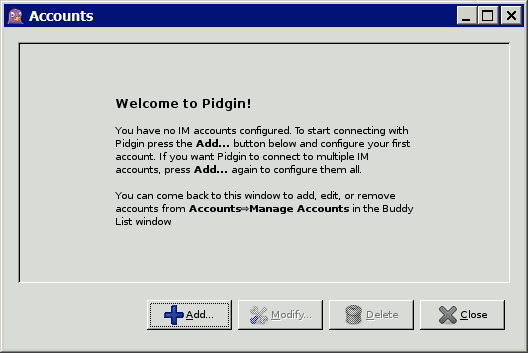 I will now describe the usage of a software called Pidgin, because it is available for Windows, Mac OS X, Linux and many other operating systems. The same instructions should work for similar chat software. You can download pidgin free of charge. After you install it and start it for the first time, you will start creating your first connection, called an "Account". Set the Protocol to IRC. Note: if your username has a space in it, replace it with an _ (underscore) (e.g. "Big Bull" => "Big_Bull".) Make sure that the capitalization matches your name correctly. Set the Server to irc.meetfighters.com. Enter your MeetFighters password (the same password you use when you log on to the site). Check Remember password if you like. After you're done, click Add. Once you're done creating your account, click the "Enabled" check mark that is right next to your account name ("My_Name@irc.meetfighters.com"). Congratulations! You are now connected to MeetFighters Chat with Pidgin!